The Baltimore Ethnic Identity. A newsletter for ethnic activities in Baltimore. Olkio, Kalevi, ed. B.B.K.M. (Benevolent Brotherhood of Kolo Maniacs). Monthly publication founded by Pompei, Bill and Barbara, and continued by Mitchell, Bruce. Sacramento, California. The Federation Folk Dancer, a magazine started by Ed Kremers in the early 1940s as the organ of the Folk Dance Federation of California, Inc. and which became Let's Dance! when Michael and Mary Ann Herman, publishers of The Folk Dancer magazine, objected. Folk and Square Dance Newsletter, January 1952, March 1954. Folk Dance Newsletter, Stern, Ed. 1970-. St. Paul, Minn., Irregular. Foundation for Ethnic Dance, 1521 Nit? ?, Oklahoma City OK 73103). The Folk Dancer, a magazine published by Michael Herman. Described by Vyts Beliajus as containing "excellent material covering the folk dance field and related subjects." The Folk Dancer (Manchester), a magazine edited by Hugh Thurston. Folk Dancer Online, a magazine published by the Ontario Folk Dance Association, formerly known as Ontario FolkDancer. Folk Dance Scene, a magazine serving as the organ of the Folk Dance Federation of California, South, Inc.. Called by Vyts Beliajus "the very best (publication) to serve a community … it carries all the news about every organization in the Southern California area, plus: club activities, camps and the folk dance tavernas." Folktivities, a newsletter published by Frank Alsberg. Foot 'n' Fiddle, a magazine. Various editors. Austin, Texas: 1949-?. Footnotes, magazine, published by Westerner's Square Dance Association. Footnotes (or Foot Notes), a magazine. Seattle, Wash.: Folk Dance Federation of Washington. Karikázó. A newsletter for the Hungarian dance movement, edited by Kálmán and Judith Magyar. Latest Steps, newsletter published by Sacramento Council of Folk Dance Clubs, Sacramento, California. Let's Dance!, a magazine published from about 1942 to the present as the organ of the Folk Dance Federation of California, Inc..
Lore, a folklore magazine published by Vyts Beliajus, 1936-1938 or 1939. Chicago, Ill.: Chicago Park System. Described by Vyts as "sort of like a forerunner of Viltis," published with WPA money. Mixed Pickles. A New York folk dance newspaper published by Ray LaBarbera, consisting largely of his folk dance directory and calendar. New England Caller, a magazine. Baldwin, Charles. ed. Quincy, Massachusetts. Northern Junket, a mimeographed magazine edited by Ralph Page, covering many subjects such as folk and square dance and music, recipes, and nostalgic lore of days of yore, with plenty of New England humor. Northwest Folk Dance News, also called Northwest Folkdancer, a newsletter published by Northwest Folk Dance Federation. Ontario Folk Dancer. See current title: Folk Dancer, a magazine published by the Ontario Folk Dance Association. Report to Members. Ron Houston, ed. 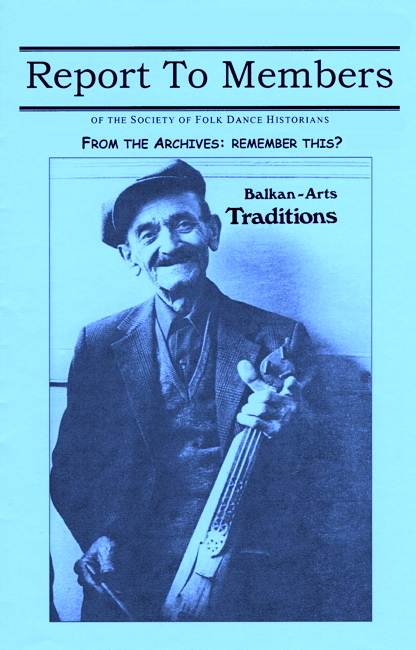 1990, Society of Folk Dance Historians (SFDH) quarterly newsletter/magazine. FREE to Society members. Rocky Mountain Folk Dance Crier. Magazine. Published by Harold and Lola Ryan. Rosin the Bow, edited by LaFarge, Rod. A folk and square dance magazine described by Vyts Beliajus as being "an excellent magazine with many good articles." Round Up Magazine. ?. Minneapolis, Minnesota. : n.p., n.d.
Scandia News Notes, Seattle Scandi newsletter. SIFD News, newsletter of the Society of International Folk Dancing. Square Dancing. A magazine edited by Bob Osgood, Los Angeles, California. Square 'N Round Magazine. Gotcher, Les, ed. La Puente, Cal. : Les Gotcher Enterprises. Tradition. National Council for the Traditional Arts. Organ of the National Folk Festival Association. The/Le Troubadour. Canadian Folk Arts Council / Le Counseil Canadien Des Arts Populaires. Edited at one time by Moreau, Yves. Viltis, a folklore and dance magazine, published by Vyts Beliajus from about 1942 to 1994 as a mimeographed (armed) services newsletter, then as a printed publication from September, 1944 to Vyts' death in 1994, when it was assumed by the International Institute of Milwaukee, Wisconsin for a few issues.